Publications - Dr. John Smith. High Resolution multidimensional Biological NMR. BBSRC Structural Biology and Design Initiative. Awarded £141,536, ran from Nov. 1997 - Nov. 2000. The high resolution structure of domain III of proton-translocating nicotinamide nucleotide transhydrogenase. see the BBSRC Structural Biology and Design Initiative site and search the research database for Grant Reference: SBD07558. Transhydrogenase pumps protons across a membrane. Domain III of the protein probably contains the essential machinery that couples the chemical reaction (hydride transfer between NAD(H) and NADP(H) to H+ translocation. We have expressed and purified domain III protein from bacterial transhydrogenase in large quantities. The recombinant protein has a very high affinity for NADP(H) and, together with the ND(H)-binding domain I protein, can catalyse hydride transfer, even in the absence of the membrane-intercalating domain II. Recombinant domain III protein of transhydrogenase is soluble and stable; it has an excellent 1H- 1H 2D NMR spectrum. The primary objective of this work is to solve the high-resolution structure of the protein using NMR spectroscopy. We shall also initiate crystallisation trials of the domain I:III complex with a view to obtaining high resolution structure by X-ray diffraction. Brear,K. Currey,J.D. Raines,S. & Smith,K.J. (1988) Engineering in Medicine, 17, 4, 163-167. Density and temperature effects on some of the mechanical properties of cancellous bone. This project was done at York University. the journal "Engineering in Medicine" is now defunct. Short Report: The use of peptide mimetics and proton magnetic resonance to define actin binding sites on the myosin head. Trayer,I.P., Keane,A.M., Murad,Z., Ruegg,J. & Smith,K.J. The use of peptide mimetics to define the actin binding sites on the head of the myosin molecule. Protein-protein interactions are involved in muscle contraction and signal transduction. This book describes how synthetic peptides may be used, much like antibodies, both as specific inhibitors and as molecular probes to explore the cognitive interfaces between interacting proteins and their functional significance. This offers the prospect of very selective intervention in cellular mechanisms. These contributions by several experts should appeal to the researchers in muscle physiology, cardiovascular pharmacology and cell biology who are interested in this new approach. (1992) J.Muscle Res.Cell Motil., 13, 220. Short Report: Location of an S1 binding site on an a-helical region of actin. An 18-residue peptide from actin comprising of residues 77-95 (T77NWDDMEKIWHHTFYNEL94) has been synthesized and purified. According to the recent published actin structure (Kabsch, W. et al. (1990) Nature 347, 37-44), residues 79-92 form a surface a-helix at the top of subdomain 1. In aqueous solution at pH 7.8, and over a temperature range 10-26oC, extensive two-dimensional NMR studies have shown that this peptide adopts an a-helical structure from W79-H88. At this point the helix is disrupted but appears to reform towards the C-terminus. Even in the helix-inducing solvent, trifluoroethanol, where the helical regions are strengthened, this helix break is still found. NMR studies have also shown that this peptide binds to S1, predominantly around the helix disruption region and at selected other amino acids. The specificity of this binding is shown by the fact that the peptide is readily displaced from S1 by actin and that the interaction still occurs when the ionic strength is raised to 0.5 M. After iodination with 125I, the peptide was crosslinked to S1 with the zero length crosslinker EDC. Radioactivity was only associated with the tryptic 50 kDa domain and has so far been located in the N-terminal 40 kDa fragment of this domain. The exact interaction site is currently under investigation. Rather interestingly, this peptide does not appear to inhibit or activate the actin-stimulated Mg.ATPase of S1. We have been using this peptide to probe the architecture of S1 by using the distance dependent broadening effect of suitably located nitroxide spin labels on the peptide 1H-NMR signals. A spin-labelled ADP analogue (Alessi, D. et al. (1991) J. Chem. Soc. ) in the active site of S1 was found to broaden resonances from the peptide bound to S1 indicating that the two sites are < 1.5 nm apart. The spin-labeled ATP has been shown to be hydrolyzed by S1 and to support muscle contraction). Furthermore, a nitroxide spin label attached to 707Cys, situated in another actin-binding site on S1, also broadens resonances arising from this actin peptide, emphasizing the spatial proximity of the two actin-binding sites on different domains of S1. Reduction of both spin-labeled moieties in situ with ascorbate removes their paramagnetic effects. Comparison of the binding of this peptide to S1 and to an S1.ATP analogue state (pPDM-S1), the latter representing a weak-binding S1.ATP conformation, reveals that the actin peptide binds differently and more weakly to the pPDM-S1. That is, this actin-binding site can distinguish between the strong- and weak-binding S1 states. Local backup of Full text webpage and here is the full article pdf. (1993) PhD. Thesis, Dept. Biochemistry, University of Birmingham. The Use of Peptide Mimentics to Investigate the interface between Actin and Myosin. It has been known for some time that small peptides corresponding to certain sequences in proteins are capable of adopting conformations in aqueous solution that are similar to the conformation in the native protein (eg. Goodman & Kim, 1989, Biochemistry, 28, 4343-4347). Small peptides corresponding to sequences in actin and myosin, which are thought to be interaction sites between actin and myosin, are known to interact with the reciprocal protein partner in such a way that they interfere with the biological activity of the actomyosin system in assays both using the isolated muscle proteins (eg. inhibition of the actin activated Mg2+ATPase activity) and using intact myofibrils (eg. inhibition of force generation; eg. Keane et al., 1990, Nature 344, 265-268). The relationship between the structure adopted by these peptides and the biological activity has not previously been investigated. In this thesis peptides from both actin and myosin have been identified which specifically bind to the protein partner (myosin S1 peptides corresponding to sequences from the 20 kDa domain 704-710 and 718-727, and from 50 kDa domain 609-618, each of which bind to F-actin; actin peptides: 16-41, 77-94, 29-58 and 96-117, the first two of which bind to the myosin S1 head). The binding residues within these peptides have been identified by the observation of broadening of resonances in NMR and, for some of the peptides, the site of interaction in the protein template has been determined by chemically crosslinking the radioactively labelled peptide to the protein. In addition for many of the peptides identified as binding sites, the solution structure of the isolated peptide was determined by NMR spectroscopy (and in one case by CD spectroscopy). In particular a helical peptide (actin 77-94) and extended peptide (myosin 718-727) were investigated. In each case an attempt was made to relate the solution structure to the observed binding properties. In the two peptides corresponding to actin 77-95 and myosin 718-727, transferred NOESY spectra were recorded in the presence of the protein partner, and some observations of the conformation adopted by the peptide when bound to the protein template were made. In addition the spatial relationship between the SH1 (707Cys) and SH2 (697Cys) thiols and the ATPase site in the S1 head was investigated by 19F labelling the thiol and using a spin labelled analogue of ATP. A region of the myosin S1 head corresponding to residues 601-635 was sequenced. A preliminary HTML version of my thesis available - here (no figures yet). "Smith, Kevin John. - The use of peptide mimetics to investigate the interface between actin and m. - Birmingham : University of Birmingham, 1992. - v8157600 "
(1993) J.Muscle Res. Cell Motil., 14, 272. Short Report: Analysis of the weak binding site on actin. We recently reported that an 18-residue peptide, comprising residues 77-95 of the actin structure, forms part of the myosin binding site on actin (Alessi et al. (1992) J. Muscle Res. Cell Motil. 13, 220). In actin, this region is largely a-helical, with an unwinding of the helix at the C-terminus (a-helix -> 5-turn helix), and is located at the top and 'side' of subdomain 1. This peptide binds equally well to S1 alone and to an S1-ATP analogue state, suggesting it forms a contact point in the weak binding acto-S1-ATP complex which is consistent with recent image reconstruction studies (Milligan and Holmes, unpublished data). Extensive analysis of this peptide in solution and when bound to S1 has been carried out by NMR and its structure determined from NOESY spectra using the simulated annealing protocol of X-PLOR. In 50% aqueous trifluoroethanol (TFE), the peptide was essentially a-helical over most of its length with both the backbone and side chains aligned. The helix was slightly curved and further analysis showed that there was a discontinuity between H87 and H88 that was most apparent in the Ramachandran plots and seemed to originate at a break in the regular organization of the side chains; up to H87 the side chains were aligned C->N and after H88 they were aligned N->C. In most a-helices the side chains align either N->C or C->N without the break. In 90% H2O, the helical character of the backbone is still apparent although the side chains are more flexible and the C-terminal end unwinds out of the a-helix, i.e. in some respect it is more like the structure found in actin. Using the transferred NOESY method, the structure of the peptide bound to S1 in 90% H2O was also determined. This was found to be much more like that in 50% TFE as evidenced by the larger number of transferred NOEs than NOEs found in water in the absence of S1. The backbone was mostly helical and the side chains more ordered. In particular, residues W86- H87, were held relatively rigid indicating that these two amino acids were the major contact points with S1. In actin, H87 (and H88) are readily available for interaction with S1 but W86, is buried. However, limited molecular dynamics calculations based on minor changes in winding of the C-terminal region of this helix show that W86, can be exposed (and H88 buried) at this discontinuity point in the helix. This could be a means whereby S1 could deform the actin structure and transmit information through the molecule. As controls it has shown that peptides containing the a- helical region 113-125 also retain their structure in solution but do not bind to S1. This is the major surface feature of the 'back' of the subdomain 1. We are presently investigating peptides containing the 338-348 helix, which is a dominant feature of the 'front' of subdomain 1. Local backup of Full text PDF and here is the full article pdf. Jaseja,M., Smith,K.J., Lu,X., Williams,J.A., Trayer,H.R., Trayer,I.P. and Hyde,E.I. (1993) Eur. J. Biochem., 218, 853-860. 1H-NMR studies and the secondary structure of the RGD-containing snake toxin, albolabrin. Albolabrin is a naturally occurring peptide from snake venom containing the sequence Arg-Gly-Asp (RGD). It inhibits platelet aggregation by blocking the binding of fibrinogen to the glycoprotein Gp IIb-IIIa, on the surface of activated platelets. Albolabrin consists of 73 residues with six intramolecular disulphide bonds. The 1H-NMR spectrum of albolabrin has been assigned using homonuclear two-dimensional techniques and its secondary structure determined. Like kistrin and echistatin, two related peptides from snake venom, albolabrin appears to have little regular secondary structure in solution. Several bends and two short distorted beta sheets are observed. The RGD sequence, important for binding to the receptor, lies in a mobile loop joining two strands of one of these beta sheets. This loop undergoes a pH-dependent conformational change. get this article from the European Journal of Biochemistry site (Now the FEBS Journal). Smith,K.J., Trayer,I.P. and Grand, R.J.A. (1994) Biochemistry, 33, 20, 6063-6073. Structure around the cleavage site in the thrombin receptor determined by NMR spectroscopy. NMR spectroscopic experiments were performed to study the structure of synthetic peptides identical to two extracellular regions of the human thrombin receptor. The smaller molecule, comprising 14 amino acids, was biologically active and was equivalent to the ''tethered ligand'' exposed after cleavage of the receptor by thrombin. The principal structural elements were two overlapping turns (amino acids 5-8 and 6-9), the second of which was stabilized by a hydrogen bond, 6(CO)- 9(NH). The five N-terminal residues, considered to be responsible for biological activity, were essentially unstructured. A second version of this peptide, biologically inactive due to the reversal of the two N-terminal amino acids, had a very similar structure. A longer peptide (23 amino acids) covering the proposed thrombin cleavage site was found to be more highly structured. The seven residues from Pro(-2) to Arg(5) (the N-terminal amino acid exposed after cleavage is taken as residue 1) formed a 3(10) helix which is not present in the shorter tethered ligand peptide. The structure is partially stabilized by a charged hydrogen bond between the side chains of Arg(-1) and Asp(-3). The overlapping turns observed in the shorter peptides could also be distinguished in the longer molecule. On the basis of the structure determined for the peptide which encompasses the cleavage site and the determined structure of thrombin, a model is postulated for the interaction of the thrombin receptor and the protease during activation. Local backup of Full text webpages and here is the full article pdf. Trayer,I.P, Smith,K.J., Eastwood,A.M., and Trayer,H.R. Short Report: Peptide mimetics as a probe of the contractile cycle. The various sites by which actin and myosin contact each other during the contractile cycle have been identified using synthesized peptides to mimic each individual site in turn and employing the partner protein to act as the molecular template. Specific binding has been established by using NMR techniques, by showing they were competitive inhibitors of the acto-S1 Mg.ATPase activity and by direct binding studies. The structure of each peptide in solution has been investigated by 2D-NMR techniques and was found to possess the same elements of secondary structure as in the parent protein. In some cases, the structure of the peptide bound to its partner has been determined by the transferred NOESY experiment which revealed subtle changes in the peptide structure on binding, suggesting how the allosteric response between different sites might be communicated. The sites on actin that have been identified as binding to S1 are contained within the N-terminal region, residues 338-349, 77-94 and the loop around residue 40. The sites on S1 identified as containing residues binding to actin are 400-416, 528-552, and 568-579. Experiments monitoring the displacement of S1 from actin (± ATP) have allowed contacts that occur in the weakly attached acto-S1 complex to be distinguished from the strongly attached states and have suggested an ordered and sequential docking of the two proteins. Smith,K.J., Jaseja,M., Lu,X., Williams,J.A., Trayer,I.P., Hyde,E.I. and Trayer,I.P. (1995) Intl. J. Peptide & Protein Research, 48, 3, 220-228. 3-Dimensional structure of the RGD-containing snake toxin Albolabrin in solution, based on 1H-NMR spectroscopy and simulated annealing calculations. Albolabrin is a snake toxin that contains a RGD-(Arg-Gly-Asp) sequence motif and competes with fibrinogen to bind to the integrin alpha IIb beta 3 (GpIIb-IIIa) on platelets. It thus inhibits platelet aggregation and cell-cell adhesion. It shows a high sequence similarity to other disintegrins, yet the reported disulfide bonding pattern for this peptide differs from that of others in this family. Recently we reported the assignment of the 1H-NMR spectrum of albolabrin and a preliminary description of its secondary structure [Jaseja, M., Smith, K.J., Lu, X., Williams, J.A., Trayer, H., Trayer, I.P. & Hyde, E.I. (1993) Eur. J. Biochem. 218, 853-860]. Here we present a more detailed description of the secondary and the tertiary structure, based on the 1H NMR results and simulated annealing methods. The structure of albolabrin in solution was calculated using 318 distance and 18 dihedral angle restraints. The average atomic RMS deviation between 12 refined structures and the mean structure was 3.1 Angstrom for the backbone. The protein appears to be highly mobile. Its structure is dominated by a series of turns and by three hairpins, each with a short region of distorted antiparallel beta- pleated sheet, held together by six disulfide bridges. The most well defined area is the hydrophobic core, residues 21-37 and 57-67, which is clustered around F40 and has a backbone atomic RMS deviation of only 1.3 Angstrom from the mean structure. The RGD adhesion sequence is found at the highly mobile tip of one of the beta-hairpins, protruding from the body of the protein. Many of these structural features are similar to those of other disintegrins, and differences in the disulfide bonding pattern of the disintegrins can be accomodated without significant energy penalty. Comparison of this structure with other proteins of similar function suggests that it is the RGD-loop, rather than the precise topology of the proteins, that is important to antagonist activity. Local backup of Full text webpage and here or here is the full article pdf. the International Journal of Peptide and Protein research and Peptide Research was succeded by the Journal of Peptide Research, which is now defunct. Smith,K.J., Scotland,G. Beattie,J. Trayer,I.P. and Houslay,M.D. (1996) J.Biol.Chem., 271, 28, 16703-16711. Determination of the structure of the N-terminal splice region of the cyclic AMP-specific phosphodiesterase RD1 (RNPDE4A1) by 1H-NMR and identification of the membrane association domain using chimeric constructs. A 25-residue peptide representing the membrane targeting N-terminal splice region of the cyclic AMP phosphodiesterase RD1 (RNPDE4A1) was synthesized, and its structure was determined by 1H-NMR, Two independently folding helical regions were identified, separated by a highly mobile ''hinge'' region, The first helical region was formed by an N-terminal amphipathic a-helix, and the second consisted of multiple overlapping turns and contained a distinct compact, hydrophobic, tryptophan-rich domain (residues 14-20), Chimeric molecules, formed between the N-terminal region of RD1 and the soluble bacterial protein chloramphenicol acetyltransferase, were used in an in vitro system to determine the features within the splice region that were required for membrane association, The ability of RD1-chloramphenicol acetyltransferase chimera to become membrane-associated was not affected by deletion of any of the following regions: the apolar section (residues 2-7) of the first helical region, the polar part of this region together with the hinge region (residues 8-13), or the polar end of the C-terminal helical region (residues 21-25), In marked contrast, deletion of the compact, hydrophobic tryptophan-rich domain (residues 14-20) found in the second helical region obliterated membrane association, Replacement of this domain with a hydrophobic cassette of seven alanine residues also abolished membrane association, indicating that membrane association occurred by virtue of specific hydrophobic interactions with residues within the compact, tryptophan-rich domain, The structure of this domain is well defined in the peptide, and although the region is helical, both the backbone and the distribution of side chains are somewhat distorted as compared with an ideal a-helix, Hydrophobic interactions, such as the ''stacked'' rings of residues Pro(14) and Trp(15), stabilize this domain with the side chain of residue Leu(16) adopting a central position, interacting with the side chains of all three tryptophan residues 15, 19, and 20, These bulky side chains thus form a hydrophobic cluster, In contrast, the side chain of residue Val(17) is relatively exposed, pointing out from the opposite ''face'' of the peptide, Although it appears that from the opposite ''face'' of the peptide, Although it appears that this compact, tryptophan-rich domain is responsible for membrane association, at present the target site and hence the specific interactions involved in membrane targeting by the RD1 splice region remain unidentified. See also Brookhaven Database PDB entry 1LOI. Biochemical Journal during the whole of 1997.
large version of the cover. M. Houslay, J. Smith, G.Scotland, J. Beattie, I. Trayer. Studies on the RD1 peptide with Prof. Miles Houslay, at Glasgow Univ. (1997) Trends in Cell Biology, 7, 7, 259-263.
Review: Motoring down the highways of the cell. All eukaryotic cells contain large numbers of motor proteins (kinesins, dyneins and myosins), each of which appears to carry out aspecialized force-generating function within the cell. They are known to have roles in muscle contraction, ciliary movement, organelle andvesicle transport, mitosis and cytokinesis. These motor proteins operate on different cytoskeletal filaments; myosins move along actin filaments, and kinesins and dyneins along microtubules. Recently published crystal structures of the motor domains of two members of the kinesin superfamily reveal that they share the same overall fold the kinesin superfamily reveal that they share the same overall fold that is also found at the core of the larger myosin motor. This suggests that they may share a common mechanism as well as a common ancestry. Local backup of Full text webpage and here is the full article pdf, and here is the full color article pdf. Jeeves,M. Smith,K.J. Quirk,P.G. Cotton,N.P.J. & Jackson,J.B. Assignment of the NADP(H)-binding Component (domain III) of the proton-translocating transhydrogenase from Rhodospirillum rubrum. The 1H, 15 N spectrum of domain III. Molloy,D.P. Smith,K.J. Milner,A.E. Gallimore,P.H. & Grand,R.J.A. (1999) J. Biol. Chem., 274, 6, 3503-3512. The Structure of the Site on Adenovirus Early Region 1A Responsible for Binding to TATA-binding Protein Determined by NMR Spectroscopy. Previous detailed mutational analysis has shown that the binding site on adenovirus (Ad) early region 1A (E1A) for TATA-binding protein (TBP) is located toward the N terminus of conserved region 3 (CR3). Here we demonstrate that synthetic peptides of between 15 and 22 amino acids, identical to amino acid sequences of CR3 present in the larger Ad5 E1A (13 S product) and in both the Ad12 E1A (13 and 12 S products) proteins that lie N-terminal to the zinc finger motif, can disrupt binding of E1A to TBP. These findings suggest that the peptides are biologically active in terms of interacting with TBP and must therefore comprise some, if not all, of the TBP binding site on E1A. The interaction between Ad12 E1A and TBP was confirmed by direct co-precipitation experiments. In 1H NMR studies of CR3 peptides, regular patterns of NOEs were observed from which their conformational preferences in aqueous solution were determined. Both Ad5 and Ad12 peptides were shown to contain regions of helical backbone structure in 50% trifluoroethanol. In each case, the type and intensities of NOE cross-peaks observed correlated best to a-helical turns. These helices are more extensive in larger peptides and extend from Glu141 to Val147 and from Arg144 to Pro152 in the full-length Ad5 and Ad12 13S E1A proteins, respectively. The structure of a 19-residue Ad5 CR3 peptide carrying the V147L mutation in the full-length protein that abolishes TBP binding was examined. No significant differences between the substituted and wild type peptides were observed, suggesting that this substitution in the intact protein may cause disruption of global rather than local structures. Timson,D.J. Trayer,H.R. Smith,K.J. & Trayer,I.P. Size and Charge Requirements for Kinetic Modulation and Actin Binding by A1-type Myosin Essential Light Chains. There are two forms of essential light chain (ELC) in vertebrate striated muscle: A1-type and A2-type. Consequently there are two isoenzymes of myosin subfragment 1 prepared by chymotryptic digestion of myosin: S1A1 and S1A2 depending on which ELC is associated with the heavy chain. A1-type ELCs have an additional 40 or so amino acids residues at the N-terminus compared to the A2-type. These additional amino acids in A1-type ELCs are responsible for binding actin and modulating the kinetic activity of myosin molecules that carry them. The requirements for actin binding and kinetic modulation of the myosin motor by an A1-type ELC have been investigated by a protein engineering approach. Mutations in the actin binding site of the human atrial ELC (HmAtELC) result in altered actin activated MgATPase kinetics when the recombinant light chains are hybridised into rabbit skeletal myosin subfragment 1. Substitution of the positively charged lysine residue at position 4 with the neutral amino acid alanine results in decreased kinetic modulation (the resulting hybrid S1 has kinetic parameters approximately midway between S1A1 and S1A2 under the same conditions) and decreased actin binding (as judged by chemical cross-linking). Replacement of this residue with aspartate (negatively charged) reduces actin binding still further and the hybrid S1 is almost S1A2-like in its kinetic parameters. Substitution of lysine 3 by alanine gives similar results to same replacement at position 4. However, the size of the side chain at position 1 is unimportant: alteration of the wild type amino acid (alanine) to valine results in no change in the kinetic parameters of the hybrid S1 or in the ELC's ability to bind actin. Furthermore we found a statistically significant positive correlation between the apparent KM for actin and the Kcat for Mg.ATP turnover for each mutant hybrid. This strengthens our belief that the binding of actin by A1-type ELCs results directly in modulation of the myosin motor. Quirk,P.G. Smith,K.J.. Thomas, C. & Jackson,J.B. The Mobile Loop Region of the NAD(H)-binding component (dI) of proton-translocating Nicotinamide Nucleotide Transhydrogenase from Rhodospirillum rubrum: Complete NMR assignment and effects of bound nucleotides. The dI component of transhydrogenase binds NAD+ and NADH. A mobile loop region of dI plays an important role in the nucleotide binding process, and mutations in this region result in impaired hydride transfer in the complete enzyme. We have previously employed one-dimensional 1H-NMR spectroscopy to study wild-type and mutant dI proteins of Rhodospirillum rubrum and the effects of nucleotide binding. Here, we utilise two- and three-dimensional NMR experiments to assign the signals from virtually all of the backbone and side-chain protons of the loop residues. The mobile loop region encompasses 17 residues: Asp223-Met239. The assignments also provide a much strengthened basis for interpreting the structural changes occurring upon nucleotide binding, when the loop closes down onto the surface of the protein and loses mobility. The role of the mobile loop region in catalysis is discussed with particular reference to a newly-developed model of the dI protein, based on its homology with alanine dehydrogenase. (1999) FEBS Letters, 446, 1, 127-132. We have analysed 1H, 15N-HSQC spectra of the recombinant, NADP(H)-binding component of transhydrogenase in the context of the emerging three dimensional structure of the protein. Chemical shift perturbations of amino acid residues following replacement of NADP+ with NADPH were observed in both the adenosine and nicotinamide parts of the dinucleotide binding site and in a region which straddles the protein. These observations reflect the structural changes resulting from hydride transfer. The interactions between the recombinant, NADP(H)-binding component and its partner, NAD(H)-binding protein, are complicated. Helix B of the recombinant, NADP(H)-binding component may play an important role in the binding process. The 1H, 15N spectrum of domain III bound to NADP+ and NADPH. Jeeves M.; Smith K.J. ; Quirk P.G. ; Cotton N.P.J. ; Jackson J.B.
Transhydrogenase is a proton pump found in the membranes of bacteria and animal mitochondria. The solution structure of the expressed, 21.5 kDa, NADP(H)-binding component (dIII) of transhydrogenase from Rhodospirillum rubrum has been solved by NMR methods. This is the first description of the structure of dIII from a bacterial source. The protein adopts a Rossmann fold: an open, twisted, parallel -sheet, flanked by helices. However, the binding of NADP+ to dIII is profoundly different to that seen in other Rossmann structures, in that its orientation is reversed: the adenosine moiety interacts with the first motif, and the nicotinamide with the second. Features in the structure that might be responsible for changes in nucleotide-binding affinity during catalysis, and for interaction with other components of the enzyme, are identified. 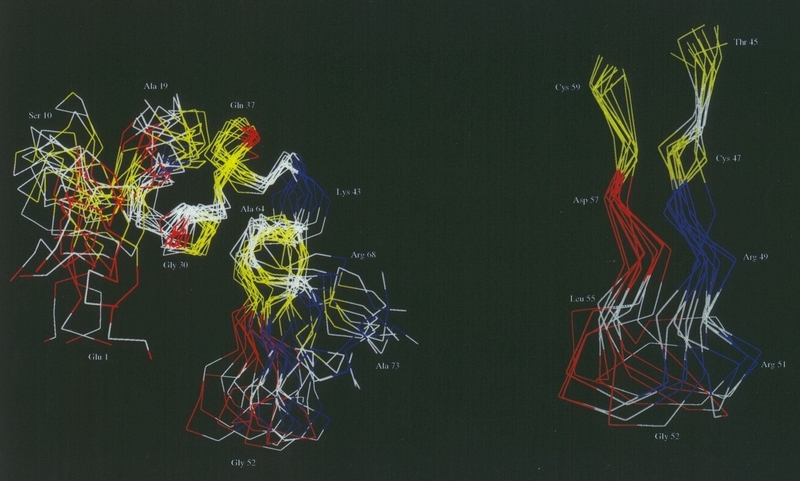 The results are compared with the recently determined, high-resolution crystal structures of human and bovine dIII which also show the reversed nucleotide orientation. It is shown that the proton NMR spectra of molecules containing rare spins at natural abundance dissolved in a liquid crystalline solvent can be obtained free from the strong lines from the spectrum of the abundant isotopomer by the 2D HSQC NMR experiment. The technique can also give the individual chemical shifts of the rare spins, and, for a molecule containing another abundant nucleus, such as fluorine, the rare spin 19F total anisotropic couplings are also obtained. The usefulness of the technique is demonstrated for molecules containing 13C as the rare spins. Ray P., Smith K.J., Parslow R.A., Dixon R., Hyde E.I. The NifA protein of Klebsiella pneumoniae is required for transcriptional activation of all nitrogen fixation (nif ) operons except the regulatory nifLA genes. At these operons, NifA binds to an upstream activator sequence (UAS), with the consensus TGTN10-ACA, via a C-terminal DNA-binding domain (CTD). Binding of the activator to this upstream enhancer-like sequence allows NifA to interact with RNA polymerase containing the alternative sigma factor, sigma54. The isolated NifA CTD is monomeric and binds specifically to DNA in vitro as shown by DNase I footprinting. Heteronuclear 3D NMR experiments have been used to assign the signals from the protein backbone. Three a-helices have been identified, based on secondary chemical shifts and medium range Hai-NHi + 1, and NHi-NHi + 1 NOEs. On addition of DNA containing a half-site UAS, several changes are observed in the NMR spectra, allowing the identification of residues that are most likely to interact with DNA. These occur in the final two helices of the protein, directly confirming that DNA binding is mediated by a helix±turn±helix motif. Local backup of Full text PDF and here is the full article pdf, and here is the supplementary material. (1)H NMR structural and functional characterisation of a cAMP-specific phosphodiesterase-4D5 (PDE4D5) N-terminal region peptide that disrupts PDE4D5 interaction with the signalling scaffold proteins, betaarrestin and RACK1. The unique 88 amino acid N-terminal region of cAMP-specific phosphodiesterase-4D5 (PDE4D5) contains overlapping binding sites conferring interaction with the signaling scaffold proteins, betaarrestin and RACK1. A 38-mer peptide, whose sequence reflected residues 12 through 49 of PDE4D5, encompasses the entire N-terminal RACK1 Interaction Domain (RAID1) together with a portion of the betaarrestin binding site. (1)H NMR and CD analyses indicate that this region has propensity to form a helical structure. The leucine-rich hydrophobic grouping essential for RACK1 interaction forms a discrete hydrophobic ridge located along a single face of an amphipathic alpha-helix with Arg34 and Asn36, which also play important roles in RACK1 binding. The Asn22/Pro23/Trp24/Asn26 grouping, essential for RACK1 interaction, was located at the N-terminal head of the amphipathic helix that contained the hydrophobic ridge. RAID1 is thus provided by a distinct amphipathic helical structure. We suggest that the binding of PDE4D5 to the WD-repeat protein, RACK1, may occur in a manner akin to the helix-helix interaction shown for G(gamma) binding to the WD-repeat protein, G(beta). A more extensive section of the PDE4D5 N-terminal sequence (Thr11-Ala85) is involved in betaarrestin binding. Several residues within the RAID1 helix contribute to this interaction however. We show here that these residues form a focused band around the centre of the RAID1 helix, generating a hydrophobic patch (from Leu29, Val30 and Leu33) flanked by polar/charged residues (Asn26, Glu27, Asp28, Arg34). The interaction with betaarrestin exploits a greater circumference on the RAID1 helix, and involves two residues (Glu27, Asp28) that do not contribute to RACK1 binding. In contrast, the interaction of RACK1 with RAID1 is extended over a greater length of the helix and includes Leu37/Leu38, which do not contribute to betaarrestin binding. A membrane-permeable, stearoylated Val12-Ser49 38-mer peptide disrupted the interaction of both betaarrestin and RACK1 with endogenous PDE4D5 in HEKB2 cells, whilst a cognate peptide with a Glu27Ala substitution selectively failed to disrupt PDE4D5/RACK1 interaction. The stearoylated Val12-Ser49 38-mer peptide enhanced the isoprenaline-stimulated PKA phosphorylation of the beta(2)-adrenergic receptors (beta(2)AR) and its activation of ERK, whilst the Glu27Ala peptide was ineffective in both these regards. Full set of configuration file for Irix6.5 from our server. Full text of grants , link to my conference posters , and slides/overheads.